In Togo, the main obstacle to the development for teaching chess in schools is lacking of . . . schools. According to UNICEF, the scolarity enrollment rate varies from 90% in the capital Lome to less than 50% in some provinces. Nevertheless, the future is open. The young Chess Federation, founded in March 2012, gives herself the goal to develop chess in school. And many NGOs are present in the country. One among others is the NGOs St. Therese of the Child Jesus (STEJ). In September 2012, it offered to a school in Kouvé tables benches and bicycles to go to school! 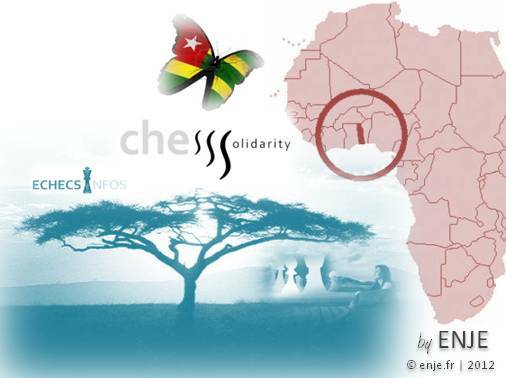 The ChessSolidarity program administrated by ENJE (which publishes ECHECSINFOS) chose this NGO for its first gift in the form of chess game sets, Reti method for teaching, flyers with chess rules, medals. We are please to confirm that the ChessSolidarity program hold his own domain name. It will be active within a couple hours (24h to 48h).